If you’re thinking about making an addition to your home, here are a few things you should consider first. Cost. When budgeting for your addition, it’s important to plan for the costs that are often associated with major home improvement projects. It’s also important to consider the additional costs of the utilities and taxes that will affect your annual budget. Investment value. Experts suggest you can recover the cost of mid-range home additions at the point of sale. This is the main inspiration for many homeowners investing in extra square footage. Even though extra square footage should drive up the value of your home, sellers don’t necessarily recoup the entire investment due to other variables associated with property values. Always work with a reputable contractor. Stress. From conflicts with contractors to the inconvenience of living in a construction zone, home renovations and new additions can be fraught with stress. While stress is a con, it’s also likely to be only a temporary problem. Moreover, selling your home and buying a new one may prove no less stressful. The most important thing is to make sure you’re using a reputable contractor. Design aesthetics. A poorly designed addition can detract from the appearance of your home. It’s important for homeowners to work with an architect who has the experience and knowledge to create an addition to keep the aesthetic of your home. An addition that’s mismatched with the main construction can detract from the visual appeal of the house and ultimately turn off buyers. 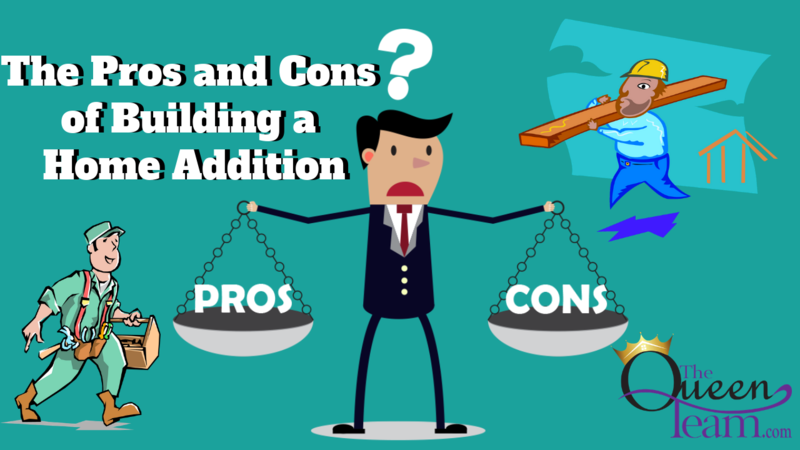 Consider all the pros and cons when it comes to making a decision about a new home addition. Talking to other homeowners can also help you gather advice and enhance your decision making process.